Come make your everyday chocolate experience into something extraordinary at Max Brenner. Max Brenner has a family-friendly environment and leaves you wanting to come back. Entering Max Brenner you would see vats of gurgling chocolate, where shelves are stacked with bars, powders, and toppings as well as the decorated chocolates. Then the pipes along the ceiling are painted dark brown to convey the idea that they carry chocolate. And everywhere you look on panels of glass, patches of the wall, or the pages of the spiral-ring dessert and drinks menu, you see chocolate musings and mottos. Their desserts and drinks menu contains a lot of options for the chocolate lovers. Starting off with Hot chocolate that is served in their Hug Mug, a mug designed to be hugged by both hands to give you an experience of coziness and warmth. Hot chocolate is served in your choice of milk, dark, or white chocolate and costs approximately $7. Milkshakes and choc-tails are served in their signature Alice Cup, inspired by the Alice Wonderland, designed to enhance the fantasy aspect of the chocolate drinking ceremony. Their milkshakes and choc-tails cost $7. Chocolate Fondue Tower is a chance to experience chocolate in a different level by including your favorite sponge cake to fruits. Chocolate Fondue Tower is one of the most highly demanded dessert choice by the people coming to Max Brenner. This will cost from a range of $12 to $25 depending on which Fondue experience you are looking forward to. 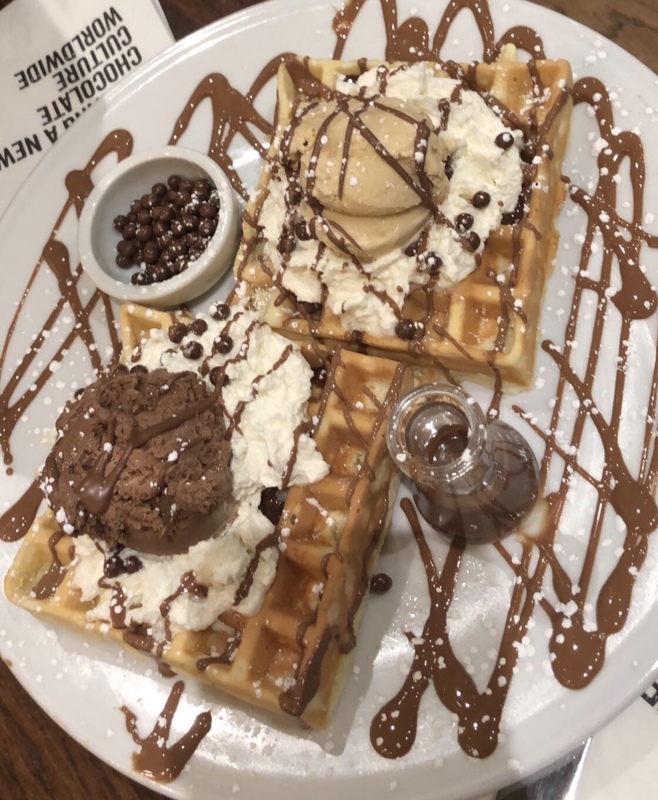 At Max Brenner, I had one of their Sweet Waffles, the Munchies Waffle, which was two waffles that came with your choice of two ice cream (salted caramel, chocolate, vanilla), milk chocolate drizzle and whipped cream. I chose salted caramel and chocolate as my choice of ice cream. I was really amazed at how amazing it tasted. It really left me wanting to get more. The waffles were cooked well and the chocolate incorporated just melted in my mouth. The ice cream made the experience better than how it already was. “I love going to Max Brenner. I love going there to get their Strawberry Hazelnut Crepe Brulée,” said Parneet Kaur, a student at Thomas Edison. Overall, my experience at Max Brenner was great. I was amazed at how well they are able to take chocolate to the next level. Max Brenner is known to be busy during the night so its recommend making a reservation beforehand. Max Brenner opens at 9 am to 12 am but hours might be different due to certain holidays. Max Brenner is located at 841 Broadway and you can get there by the Q,5,and R train. Max Brenner gets everyone leaving to be a chocolate lover.